After spending two days catching up to the International Space Station (ISS), the crew of Soyuz MS-03 docked their spacecraft with the orbiting complex at 4:58 p.m. EST (21:58 GMT) Nov. 19. The trio – NASA astronaut Peggy Whitson, Russian cosmonaut Oleg Novitskiy, and European Space Agency astronaut Thomas Pesquet – docked with the Rassvet module of the ISS. They joined the ongoing Expedition 50 crew, which includes NASA astronaut Shane Kimbrough (current commander of the laboratory) and Russian cosmonauts Sergey Ryzhikov and Andrei Borisenko. The initial three members of the current crew have been aboard the outpost since mid-October, arriving in Soyuz MS-02. After docking, crew members on either side of the docking port spent about two-and-a-half hours performing leak checks. Hatches between the two craft were opened at 7:41 p.m. EST (00:41 GMT Nov. 20). Novitskiy, Soyuz MS-03 commander, was the first to enter the outpost. He was followed by Pesquet, then Whitson. After hugs and congratulations between the now six-member crew, they made their way to the Zvezda service module for the traditional post-docking conference with friends, family, and dignitaries. After the conference, the newly arrived trio was given a safety briefing to ensure they understood the passageways to their Soyuz in case of an emergency. Additionally, various safety procedures were discussed. Novitskiy, 45, is on his second flight into space. He first flew as part of Expedition 33/34 of the ISS as a flight engineer. Pesquet, 38, is a French national. He is on his first spaceflight. Whitson, 56, is on her third flight into space. She first flew as part of the fifth expedition to the ISS back in 2002. Her second flight was in 2007 as part of Expedition 16. During that flight, she became the first woman to command the outpost. On her last mission, Whitson flew to the outpost in Soyuz TMA-11. On April 19, 2008, upon re-entry at the conclusion of her flight, a failure in the separation of the spacecraft’s propulsion module caused a ballistic re-entry to occur. This subjected her and her crew mates to forces about eight times Earth’s gravity. For the current mission, however, everything continues to go by the book. 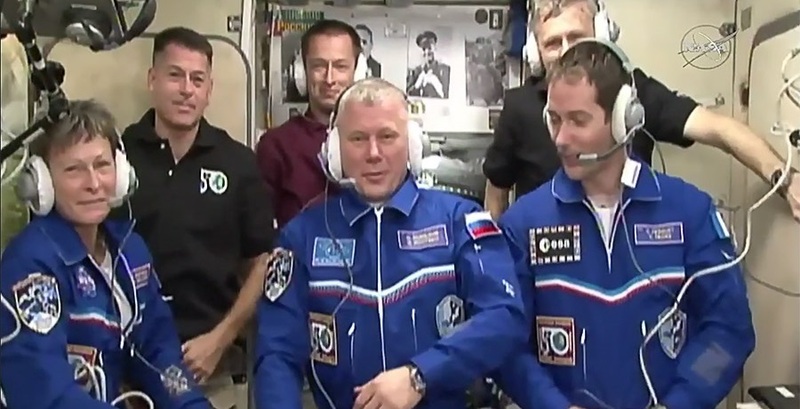 The crew’s arrival marked the beginning of a busy time for the space station. On Monday, the crew will command the robotic Canadarm2 to unberth the Cygnus cargo ship, which has been attached to the outpost for about a month. On Dec. 1, 2016, a Russian Progress cargo ship will launch with supplies and food. That will be followed just over a week later, on Dec. 9, by the Japanese Kounotori 6 cargo ship. The latter will have, among other things, a number of new lithium ion batteries. Two astronauts on a spacewalk in January will swap the station’s aging nickel-hydrogen batteries with the newly arrived ones. With Saturday’s docking, the ISS crew complement is back up to six. However, Expedition 50 will be the last six-person crew for at least a year. In a bid to save money to launch the long-delayed Nauka science module, Roscosmos announced they would be temporarily cutting back on its yearly Progress cargo ship launches from four per year to three. Roscosmos said this is not enough to support the usual six cosmonauts per year. As a result, the Russian state corporation has cut two from its crew rotation. This means the next Soyuz launch will only have two people aboard, a NASA astronaut and a Russian cosmonaut. However, the state corporation said only two are needed right now to maintain the Russian orbital segment. Six-person crews are expected to return when Nauka launches, which is currently expected sometime in late 2017 or early 2018. Saturday’s docking took place on the 18th anniversary (Nov. 20 Moscow time) of the launch of the Zarya module, the first component of the ISS. Just under two years later, the first crew, Expedition 1, would occupy the burgeoning station. Bolden said the ISS program has demonstrated what can be accomplished for the good of the world by the international collaboration with people from various cultures, countries, and ways of thinking on a single mission. “We at the International Space Station are a model for the rest of the world to follow,” Bolden said. Lovely blog it is. Thanks for this information. Amazing it is.